Heat oven to 350°F. Grease and flour 9-inch round cake pan. In large bowl, mix flour, 1 cup sugar, cocoa, soda and salt; stir in mayonnaise, warm water and vanilla. Beat with electric mixer on medium speed 2 to 3 minutes or until smooth. Pour batter into prepared pan. Bake 40 to 45 minutes or until toothpick inserted in center comes out clean. Cool 10 to 15 minutes; remove from pan to cooling rack. Cool completely, about 30 minutes. In small microwavable bowl, microwave white chocolate and whipping cream uncovered on Medium (50%) in increments of 30 seconds, stirring after each, until melted. Place in resealable food-storage plastic bag; cut off tiny corner of bag. Squeeze chocolate through hole in bag to decorate top of cake with zigzag design. In food processor, place frozen raspberries and 1/4 cup sugar. Cover; process until pureed. Strain sauce to remove seeds. Serve with cake. Place fresh raspberries around cake. *Do not substitute regular mayonnaise. 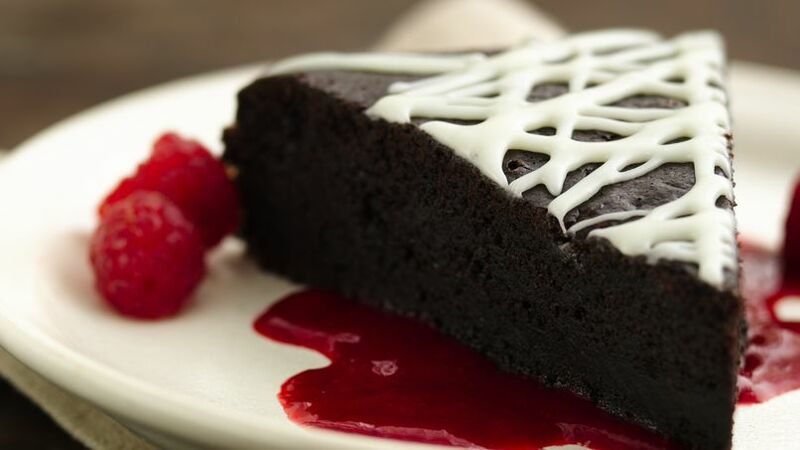 Treat your family with this cake that’s glazed with chocolate and served with raspberry sauce - a wonderful dessert.